Olymco, Inc. is one of the largest and most diversified Electroplaters in the Midwestern United States. Having been in business since 1955 our success has been based on consistently meeting the strict quality and turnaround requirements of some of the toughest industries. Our 50,000 square foot facility located in Canton, OH (which is the home of the Pro Football Hall of Fame) incorporates some of the largest plating tanks in the country at 12 feet long. We are capable of producing very large parts or a lot of small parts at one time giving us great diversity in what we can plate or how we plate. Our size has been our strength throughout the years not being too small and at the same time not being too big is what has kept us in business. By maintaining low overhead we had seen steady growth over the years. 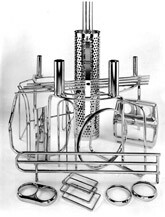 Olymco’s management team has over a century’s worth of real world experience in the plating industry. Being a family run business since it was founded in 1955 management takes a hands on approach to everything we do from answering the phone to delivering the final product. Management is there the whole way. From the very first brick that was set some 54 years ago our success here at Olymco, Inc. will always be our “Family Values” that were set in stone by our founder - Customer Service is Our #1 Goal. Our high capacity plating lines provide the fastest turnaround without sacrificing quality, while also allowing us to be very price competitive. Don’t just take our word for it let us prove it to you. Simply send us a sample part or print with the plating specifications and anticipated volumes. We will sample plate, demonstrate our quality and return them along with a quotation. Please contact us today!